As vintage sewing machine fans, we probably have more than one style of sewing machine. Most of us have multiple short shank sewing machines or multiple class 15 machines. Usually, we can swap between machines. My short shank feet fit my short shank machine no matter who made it or when it was made. I use the feet that came with my modern Brother machine on any of my short shank machines. The exception to this rule, that I have found, is the Singer slant shank machines. 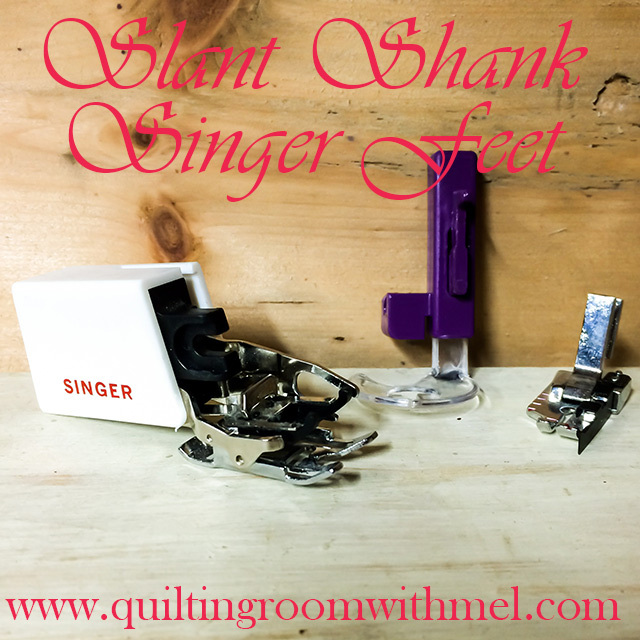 Just because it is marked Singer Slant Shank Feet doesn't mean that it will fit all Singer Slant Shank machines. Along with the bobbins and bobbin case Sewing Machines Plus sent me over a few feet for my Singer 301. I got a quarter inch foot, a walking foot, and a free motion quilting foot. I'm thinking maybe I should make them some cookies for being so generous. I was so excited to get to sewing and had no issues with the quarter inch foot. I pieced my entire charm square bag on my 301 with it. When it came time to quilt the outside of my bag I knew I wanted to use my walking foot to make the straight line quilting easier. When I put the foot on my machine it didn't work. The needle hit the foot making it impossible to use. I was heartbroken. I called Paul to whine before reaching out to Sewing Machines Plus. He told me not to call them because he thought he knew what was going on. He had seen other vintage sewing machine fans have similar issues and he wanted to do some checking before we said there was something wrong with the foot. When he got home he put the foot on our Singer 403, it was out already. It fit perfectly. The issue is with the 301 and not the foot. I didn't want to just tell you that "Hey, it fit the "newer" machines but not the "older" ones." I have swapped feet between the 400 series and the 500 series with no issues so I knew it wasn't all slant shank machines. I knew the difference had to be between the 301 and the 400 series. So a little measuring had to be done. The first thing I measured, using Paul's micrometer, was the needle clamp. I thought one might be bigger than the other. They were the same size. Then I measured the distance between the needle clamp and the foot clamp. There was a difference. The 403 was just a little wider. I wasn't convinced it wasn't me so I pulled out the protractor. That's when the picture became clear. The angles are different!! Singer changed the angle of the slant between the 301 and the 400 series. They kept the same angle with the 500 series, that's why I can swap between the 500 and the 400 but not with the 301. The angle on the 301 is 82 degress and the 403 was 80 degrees. So what's a girl to do when she really wants to use her walking foot on her 301? She pouts a little and her husband modifies the foot for her. The foot still works on the 403. We didn't hurt the foot any just made it so that it fits all of the slant shank machines we use the most. In the video, you'll see what the walking foot was doing, to begin with, look at the back of the foot. The modification also took a lot longer. It was take a little off check it on the machine, take more off, check it on the machine until it properly. In case you didn't know that's a Dremel tool Paul is using with a grinder wheel attachment. Normally, I wouldn't suggest modifying a foot to fit your machine but since I asked for a slant shank foot thinking it would fit the 301 I felt others might end up in the same boat. I want you to be able to use the fun feet with the 301 and to know that it's not the manufacture of the foot but a difference in machines. The FMQ foot needs to be adjusted too. It's plastic and I haven't decided if I will have Paul adjust it or not. If I do I'll be sharing how we did it in my newsletter so be sure to sign up for that below. Don't forget to pin the image below or hit the share button so others can find this information. I think the problem you had was with actually with the feed dogs, not the angle of the slant. I use all my slant shank attachments interchangeably on my 301 and 401. But the 301 is a straight stitch machine and the feed dogs won't line up properly with a walking foot that is intended for the wider zigzag machines. All the Singer slant shank walking feet are intended for zigzag machines, so that is most likely why it wasn't working properly on your 301. Thanks for your comment but I can assure you that the angle was the issue not the feed dogs. The feed dogs would have nothing to do with how the foot would fit onto the bar. The only time that the angle would come into play would be with a walking foot or ruffle foot. Any other slant shank foot would interchange without notice.